What a lovely idea. The thank you project. I was idly searching for any Perth appearances and found out Carl had been on the Big Couch or whatever the show is called on The Mix 94.5. There's just a photo but nothing else! I wrote and asked them to put the podcast up. oh look at his puffed out cheeks!!! lol!!! That's a fun pic!!! Thanks Angeo!! Never seen him do that before! 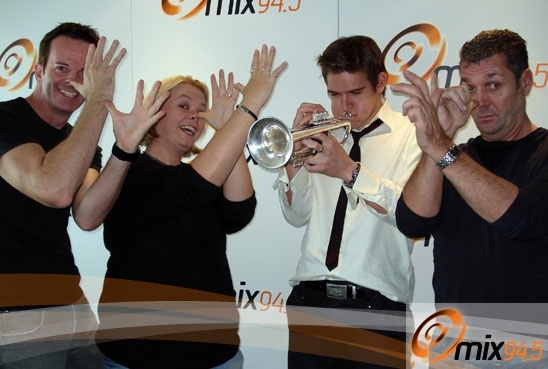 Maybe he was blowing a James Morrison type screecher? He looks to me as though he's not really playing...just having a bit of fun!!!! He's too cute!!! ambercat wrote: oh look at his puffed out cheeks!!! lol!!! That's a fun pic!!! Thanks Angeo!! oooh thanks amanda!! I'll check these out tomorrow as its very late and i should be in bed!! Thanks Amanda. I'm listening now. i don't think we have this podcast anywhere it's a bit old but i cant remember hearing it. That's the first time I've heard that one too Amanda. Thanks for finding it. Must go to bed but I'll finish listening first.